Having a car accident is a terrible experience for anyone to go through. If you are fortunate that all the parties involved make it though OK, its important to focus and document the details of the accident as much as possible. But who is thinking clearly after a wreck? 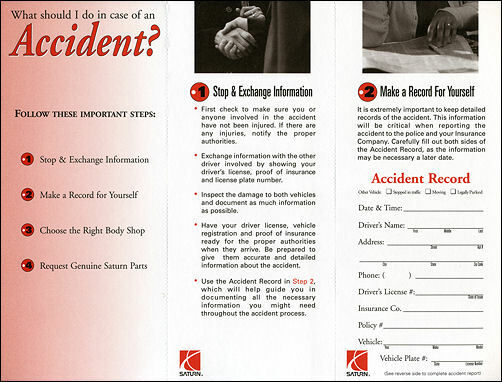 To help customers through the situation, Saturn developed a pamphlet that you could stow in your glove box. You may hear longtime Saturn enthusiasts rave about, and then lament the loss of, a steel spaceframe design forming the foundation of their cars. But what actually is a spaceframe? Car Companies Work to End Car "Totaling"
Kevin Ransom from AOL Autos via CNN: Car companies and insurers are working hard to try and reduce the cost of auto repairs and insurance premiums for consumers and some of the development is breathtaking in its innovation. This effort has already led to many new developments in the design of various auto parts and components – which have indeed led to a reduction in repair costs for various auto parts, components and structures. And more advances are on the way: some carmakers have recently ramped up their operations in this area, which should result in greater cost savings in coming years. The National Highway Traffic Safety Administration (NHTSA) reports that General Motors is recalling 276,729 model year 2009 Buick Enclave, Chevrolet Cobalt, HHR, Malibu, Traverse, GMC Acadia, Pontiac G5, G6, and Saturn Aura and Outlook passenger vehicles. Swedish automotive safety system manufacturer Autoliv recently unveiled a new passenger airbag concept that's designed to reduce weight, while maintaining exceptional crash protection. This is achieved by using a unique fabric container for the folded airbag, instead of a conventional steel or plastic housing. The new innovative passenger airbag module was introduced on the 2009 Saturn Outlook, Chevrolet Traverse, GMC Acadia, and Buick Enclave. General Motors' lineup of award-winning crossovers today adds the Insurance Institute for Highway Safety's Top Safety Pick 2008 to the growing list of accolades. The significant safety award results from the GMC Acadia meeting the Institute's highest rating for performance in its demanding front, side and rear impacts in addition to providing standard Stabilitrak, GM's electronic stability control system. The IIHS test results also apply to the GMC Acadia's sister vehicles: the Buick Enclave, Saturn Outlook, and soon to be released Chevy Traverse.